There’s something about turning a decade older that gives one pause. It is a time for reflection, taking stock of where you’ve been and where you hope to go. This feels particularly true as I and a group of lifelong friends move into our sixth decade. We’ve been together since boyhood and have walked with one another through times both joyous and hard. Richard Rohr in his book ‘Falling Upward: Spirituality for the Two Halves of Life’, writes that in the first half of life we focus on our identity: Who am I? What am I good at? Where am I going? Who will go with me? But by the second half of life we’ve experienced how fragile life can be. We’ve lost loved ones, made mistakes, dealt with health issues, had our hearts broken. Rohr writes that such painful moments raise questions we’d otherwise not ask, and offer insights we’d otherwise not have. By the second half of life we ask different questions: What do I really value? What do I truly believe in (not what others tell me)? Where do I belong? The answers don’t come easy. Yet the insights gleaned are ours alone to claim. My life is graced with good friends. 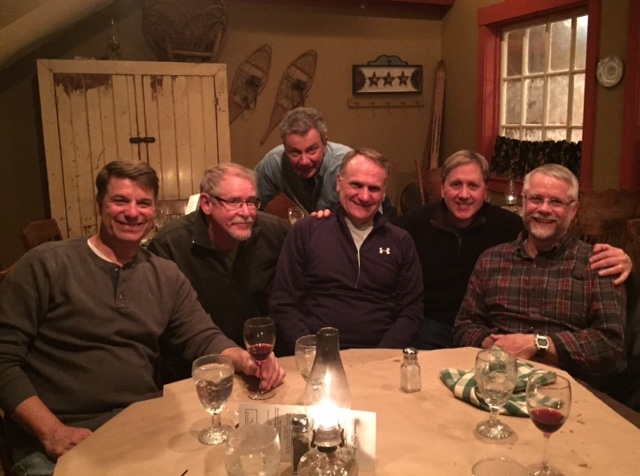 This past week six of us gathered for our annual ski trip to Loon Mountain, NH (known as Loonapalooza). We are growing old(er) together. Each year we ski, laugh (a lot), drink (a lot), eat (a lot). And sometimes we are serious together. We’ve added the ritual of raising a glass to our great friend Larry, whom cancer took from us two years ago. There’s a wonderful saying that ‘when we laugh, we grow younger’. On our annual ski trip (for a time) we grow younger. That’s a gift that paradoxically comes with age. To each of my friends who are turning 60 with me this year (pictured left to right: Rob, me, Frank, Dave, Clyde, Tom), I say: ‘Happy birthday. Thank you for the gift of your friendship.’ Can’t think of a better group of guys to get older with. Joe, take up skiing and join us next year for Loonapalooza. You’d fit right in! You guys continue to inspire!!! Howard, right back at you!